Do you live by this note investing creed? Albert Einstein is credited with these words of wisdom that have rightfully earned their worth as the investor’s mantra. While CBS news, Snopes, and academics debate whether Einstein actually authored the compounding interest quotes, there is no questioning the life altering power behind these words – regardless of their origin! Let’s say you had $10,000 and invested it at 10% per annum (or per year). At the end of the first year you would have $10,000 x .10 which equals $1,000 of interest earned for the year. Pretty straight forward but what happens in 10 years? For a total of $20,000! The table below shows how simple interest accrues (or adds up) over ten years. So what happens in 10 years? Take a look at the chart below to see how that one simple change drastically impacts the outcome. So where can an average person find an investment vehicle that has the potential to earn 10% using a monthly compounding period? Of course that’s a rhetorical question because you are already reading this article on NoteInvestor.com. Financial calculators let you set the compounding period and most note investors use a monthly compounding period to determine a purchase price at their desired return or yield. The examples show what a big difference this can make which is why we spend time in the Calculating Cash Flows tutorials going through how to adjust these settings on the HP12C and in the TValue™ Amortization software. So What Does This Have to Do With My Quote About Cake? Remember when you were a kid? You would get pretty excited about cake right? – Especially cake with frosting! But what made it really special once a year when your birthday rolled around? It was definitely the confetti sprinkles and candles on top. When you closed your eyes, made a wish, and blew out the birthday candles with one big breath – anything was possible. As an adult that is how I feel about note investing. 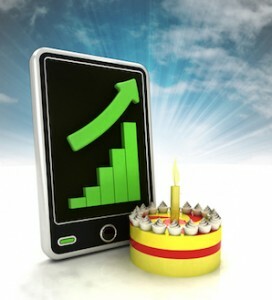 It is a delicious frosted cake and with compounding interest it becomes birthday cake with candles – and anything is possible with that kind of power behind you! You don’t need the IQ of Einstein, a financial degree, or even a love of math to master the concept. Start with a free compounding interest calculator or join me in the How To Calculate Cash Flows training for some step by step tutorials. 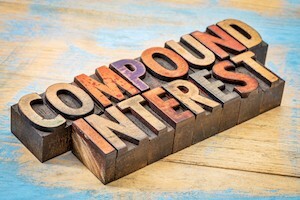 Whether it’s one small note or a whole portfolio, I invite you to experience the power of compounding interest in your own life.